Heuchera 'Jade Gloss' (PP#13,137) is a 2001 introduction from The Primrose Path. It is a small to mid size variety that has become very popular in Europe. Growth Habit - A dense mound 6" X 12" with sturdy erect flower stems to 18". Foliage - The leaves are almost entirely glossy silver with a dark green tracery of veins. 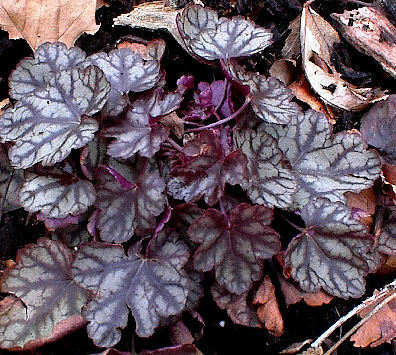 The undersides of the leaves are dark red-purple, and since the leaves tend to be slightly cupped, this contrasts nicely with the coloration of the upper side. In bright sun the upper sides of the leaves become suffused with red during the summer. 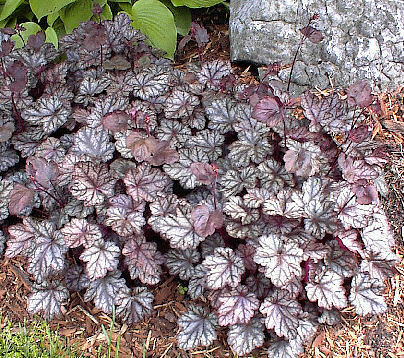 The leaves are very weather resistant and the bright color lasts through the winter (below). Flowers - In late spring and on into summer 'Jade Gloss' has stems of showy pale pink flowers from pink buds. 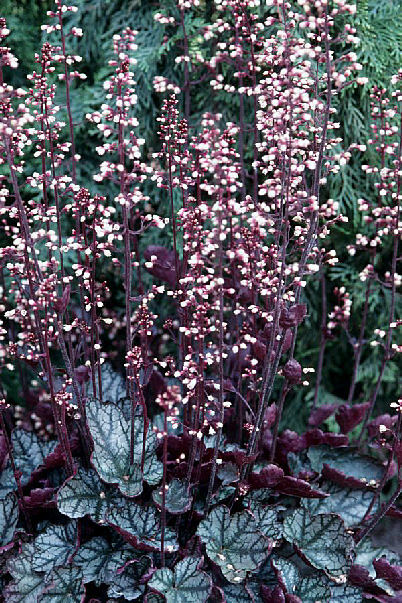 Special Features - Heuchera 'Jade Gloss' remains compact in the garden. Because of its size and upright flower stems, it is an excellent variety for container grower or for the front of a perennial bed.